"Prime Time" Is Perfect For A Weekend Or A Week In Gatlinburg! 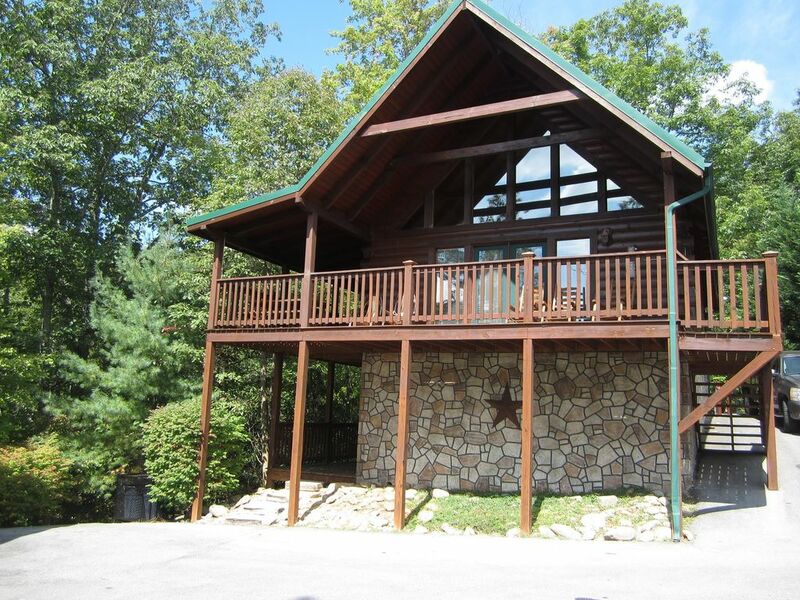 2 bedroom, 2 bath cabin, all log, overlooking the Smokey Mountain National park. Minutes to Gatlinburg, and a short drive to all the fun in Pigeon Forge. Enjoy the National Park, Ober Gatlinburg, restaurants, bars, amusements! Take a short drive to Pigeon Forge for family fun at Dollywood and Splash Country, incredible outlet shopping, and an endless selection of amusements for the kids. This cabin is 2 stories with a master suite on each floor. The main level also features open concept living, dining and kitchen are with gas fireplace in season, wood beam ceilings, fully stocked kitchen and a wall of windows overlooking the mountains. Access to the deck and the incredible view is off the living room. There is also a King Master Suite on this floor. Queen sleeper sofa in the living room. Hot tub is on the side deck in a private, tree lined area. The lower level features a game room with pool table and electronic game table featuring 60 games! Also, xbox 360, flat screen TV, and a queen sleeper sofa. There is a second King Master Suite on this floor that is very private. This cabin has a full-on view of the mountains. Lower deck features a porch swing. "Prime Time" is located in the family friendly Black Bear Falls cabin community with pool complex and meeting room/event room that can be rented for special occasions. Grocery store located near by. Convenient to the municipal parking in Gatlinburg, easy access to downtown without fighting the traffic for parking. Also, convenient to the Trolley station in Gatlinburg, park and ride and forget the traffic! UPDATE 11-30-2016! ***We are happy to report that there has been no fire damage to the cabin or the Black Bear Falls Resort. Initial news reports said there had been damage but the Home Owner's Association has inspected the property and reports today, 11-30-16, that Black Bear Falls has no damage. Currently we are waiting for the green light from the state and city to be able to go up there and have a look. Right now no traffic is allowed into the City of Gatlinburg until further notice. We greatly appreciate all the kind thoughts and prayers we have received from past guests who have seen the news and were concerned about the cabin. We are relieved and thankful for the good news we got today. We are expecting a lot of rain this week up there. When the fires die down and the smoke clears we believe that Gatlinburg will rebound and become an even better place to vacation with family and friends. Thanks to all for the kind messages!!!!!! * Update 12-22-2016, All is well at the cabin and at Black Bear Falls. All has been checked out and is looking good. We have to thank all the folks up there who help us take care of the cabin, they are working long hours and have really helped us out and we are thankful for them. And thanks to our guests who have booked since the fires, we appreciate your business. Please support Gatlinburg businesses while you are in town and at the cabin. Merry Christmas and Happy New Year y'all! I love Gatlinburg! Great place to unwind for a weekend or a week regardless of the season. The National Park is truly a special place and I love to take in the beauty whenever I can. I have visited so many times over the last 20 years and it seems there's always something new to see. Great View! Very comfortable cabin, all log and the wood construction is beautiful. I love the functional floor plan with suites on each floor. The view from the living room and the deck is incredible. This cabin seems like you're so far away from everything but yet its close to everything. No need to drive half an hour out of town for a great cabin. Great view, great atmosphere for a family getaway. This cabin is not too big and not too small, perfect for couples, small families, a weekend or a week. toilet, combination tub/shower, Attached to bedroom. 2 Full Baths, one on each level. Gas Fireplace, flat screen TV, DVD, great view of the mountains. Fully equipped, fridge, stove/oven, built in microwave, dishwasher, all cooking supplies and small appliances. Table and chairs in the main living/dining area. Cable with all premium channels including Sports Package. Each bedroom plus living room and lower level game room. Pool table, cocktail video game table with 60 games. Plenty of deck space for relaxing, visiting, and enjoying the view. Seasonal, Black Bear Falls has a great in season pool complex. On the private side deck. We loved the cabin! Super clean and very nice! Parking was a bit interesting but other than that everything was great! The Black Bear Falls cabin was very welcoming with every convenience we could ask for to make our stay perfect. Vicki was very attentive to our questions with quick and helpful responses. We hope to return again! Great family time cabin with wonderful view! Lovely cabin with a great view. We really enjoyed the pool table and video game table. I made for some great family time. Loved it!!!! Wish we could go back tomorrow!!! Nice, clean cabin. Close to the Park. Wonderful place. Really enjoyed spending 5 nights here. Close to downtown and many of the hikes we went on. Very clean and kitchen has all you need. The view was excellent as well. enjoyed everything. only downside was that pesticides may be used a little more. beautiful property. Thank you for your feedback! We are not aware of any pest problems. Can you tell us what problems you encountered? We will have it corrected immediately. Located just minutes from Downtown Gatlinburg but a world away in the mountains. Incredible views of the Smokey Mountains from your deck and front window. Beautiful in every season.